You probably think of electronics, games and movies when I mention Best Buy but did you know they also have an amazing selections of toys? Best Buy has just released their holiday toy gift guide this season and it does not disappoint! There’s something for every child ages 3 and older. After receiving Best Buy’s toy catalog in the mail I thought I’d share my top picks for gift giving this holiday season. You’ll find a huge selection of toys from classic toys, to learning toys, to tech toys. 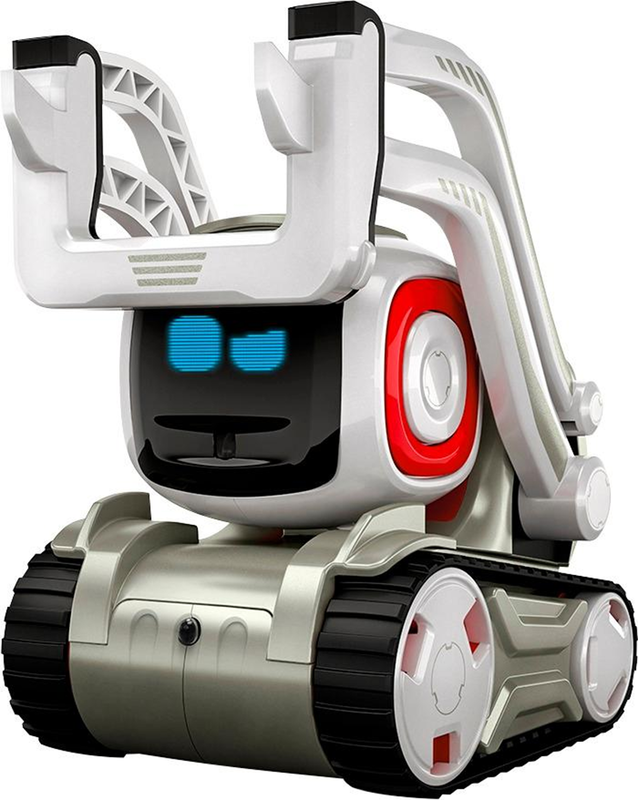 Make friends with Anki’s Cozmo the robot, a fun-loving sidekick who evolves as he gets to know you. He knows your name and face, and he can express emotions, play games and explore his environment thanks to artificial intelligence. All you need to get started with Anki’s Cozmo the robot is an Android or iOS device and the Cozmo app. Turn any area into a laser tag battlefield with this Recoil starter set. It includes two pistols and a Wi-Fi router that lets up to 16 players participate at a time, and it uses a dedicated smartphone app that keeps track of ammo and other stats. The pistols of this Recoil starter set have three hit detectors for pinpoint accuracy. Give your child a fun surprise with this Hatchimal giraffe assortment. The surprise is inside the egg, which is ready to hatch when its rainbow eyes appear, letting you see which Hatchimal was received. Once hatched, this Hatchimal giraffe plays games and talks to your child, learning new tricks as it’s nurtured. DropMix lets you play music like never before! In collaboration with the creators of Rock Band and Dance Central, this fast-paced music mixing game gives you a new way to collect, discover and combine favorite tracks. Compete with your friends (up to 4 players) and create unexpected song mixes! Keep the music pumping with 3 ways to play: freestyle, clash, and party. Delight the Star Wars fan in your family with this Sphero R2-D2 app-enabled droid. Made to resemble the iconic Star Wars character, this fun robot features authentic LEDs for realism and a motion sensor that detects your presence and reacts. An integrated speaker on this Sphero R2-D2 app-enabled droid lets him ‘boop’ and ‘beep’ in his own special language. Celebrate warm fuzzies with this FAO Schwarz anniversary bear. This commemorative plush toy wears a warm sweater for added character, and its soft light brown fur ensures a classic look. This FAO Schwarz anniversary bear measures 12 inches, making it a huggable treat for young ones and kids at heart. Step to your melody with this extra-large FAO Schwarz piano dance mat. It measures 69 x 31 inches, and it lets you play five classic tunes by following a key guide with your feet. Record and play up to 38 notes of an original composition with this FAO Schwarz piano dance mat. Head over to your local Best Buy to check out their awesome assortment and selection of toys for the holidays! They something for everyone on your list! Plus, check out hot toy demos at select stores. What’s your favorite item from the Holiday toy gift guide at Best Buy? Comment below and share with us.